dwiebenga had the most liked content! While I was on the lake this weekend, I was having an issue with my electronics. I could only get the DI to read down to 60'. I looked over the settings and it was on "Auto Depth" My SI and 2d all worked fine. Here is a pic. Any assistance from Hummingbird guys would be fantastic. Fished out of Shell Knob over the weekend with decent success. Water temp varied from 46 to 51 both days. I caught a total of 24 bass, and for the first time that I can remember no Largemouth. I focused my attention on bluff ends transitioning to rock and gravel spawning areas. My boat sat in 30-50 feet most of the weekend. The lack of wind on Saturday forced my hand to a more finesse style of fishing. I threw a 2.8 or 3.3 Keitch (Electric Shad or Pro Blue Red Pearl) on a 3/16 or 3/8 oz head. I realize the jump in size, however, I felt it was necessary to follow the steeper contours in some of the locations I fished throughout the day. I was throwing to the bank, counting down 10, and then slow rolling the bait back to the boat. I would guess bite was 15-20 feet deep. If I found one fish, there were typically multiple fish in one location. 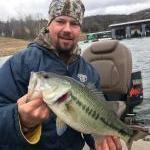 I also fished the OA One Bass tournament on Saturday, and had a blast. I caught a decent sized spotted bass (16.75 inches), but could not find an upgrade. She is still swimming in Shell Knob. Overall, I had probably 8-9 solid keepers and a 17 inch Smallie on Friday. Thank you for the great weekend! Also thank you for supporting Mission Fishing Jigs! Feel free you send my reports and feedback. This was the first batch I sold. I think it would be fun to have all of the organizations come together for this event every year. I reminds me of the old NFL championship (AFL vs. NFL). 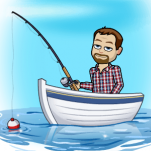 Overall, I thinking it would bring more people into the fishing world. 100% agree with Champ. I would also recommend a "silent" in one of your choice for the neutral to negative feeding fish. March 23 OAF One Bass tourney? I am good to go. Great way to end Spring Break!